You should store and regularly back up your UCA files on either your university-provided Google Drive or your network drive (faculty/staff only). This is the easiest and fastest way to ensure all your files are saved securely. Sensitive data – these are any files that contain FERPA, ACH, PCI, PII, or other classification of protected data. Sensitive data should be stored on your UCA-provided network drive. Please note that any employee who has a need to store and/or view HIPAA or PHI data should contact IST for a consultation on how to best store and maintain that data. General use data – these files can be stored either on your UCA-provided network drive OR your UCA-provided Google Drive. Follow these steps for either Google Drive or your network drive to complete this back-up process. NOTE: Computers provided to you at UCA are university property. According to UCA Board Policy 412, IST “is not responsible for the storage, backup, and/or recovery of any personal data (including but not limited to photos, music, movies, and personal files) stored on university-owned computers and electronic devices.” This also includes all Word documents, Excel spreadsheets, PowerPoint presentations, etc. Please consider this policy if you store any data on a university-owned computer, either on the C: drive, desktop, or anywhere else on the computer. The preferred method for storing sensitive data is the network drive, also known as the O: drive. This is your personal network drive. Go to My Computer, and then double-click the network location denoted with your UCA username. For example, James Smith’s network drive might be called JSMITH (\VULCAN\HOME\HOME). Click and drag any files you want to store into this network location. Google Drive is a cloud storage option that offers unlimited storage space, easy sharing of files, and the ability to access and edit your files from a web browser. 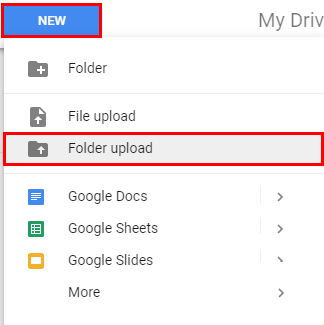 IST encourages you to take advantage of these features and store your files on their personal Google Drive associated with your UCA Google account. For more information, refer to the Knowledgebase article Google Drive FAQ. Using the Google Chrome browser, go to myUCA and log in with your UCA username and password. In the Collections menu, click Google Apps. Once logged in, click the task Google Drive. Make sure to choose the Google Drive task relevant to your role at UCA (Faculty/Staff or Students). This will open Google Drive. Click the New button, then click Folder upload. Note that this option is only available when using Google Chrome; it will not appear in Internet Explorer or Firefox. Locate the folder from the list you wish to back up (e.g. My Documents, etc. ), and then click OK. This will begin the upload process for that folder’s contents. Upload times will vary depending on the file size and bandwidth speed. When done, the message Upload complete will appear in the lower-right corner of the screen. Repeat steps 4-6 for each folder you wish to back up.